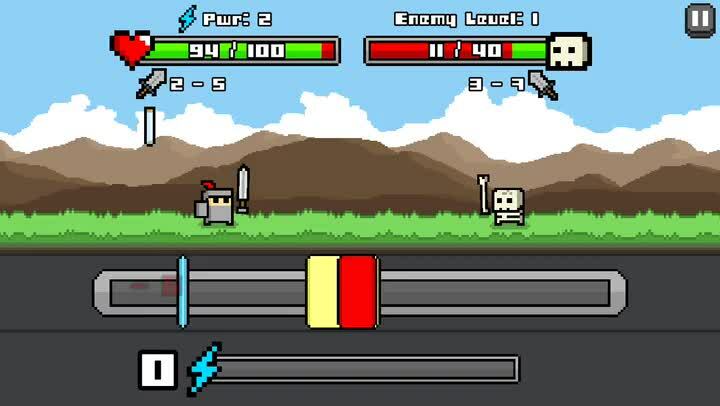 Combo Quest ($0.99) by Tapinator,LLC is a unique, endless role-playing game where you have to tap to survive. 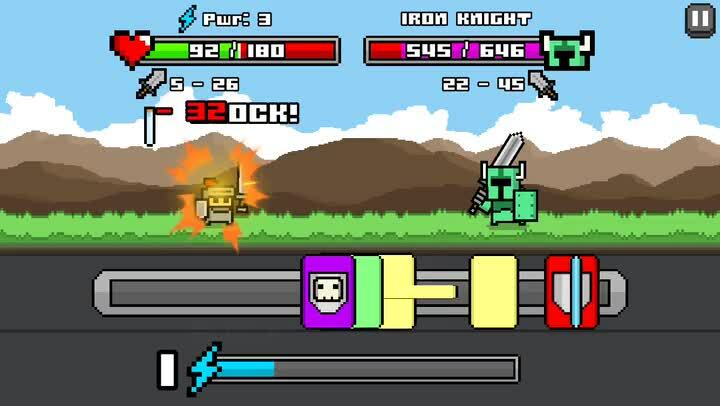 If you like games like Tap Titans or Bitcoin Billionaire, then you’ll enjoy what Combo Quest has to offer, especially if you’re also a fan of RPGs. When it comes to mobile games, you may think of tapping as a natural instinct now, thanks to the touch screen. In fact, we end up tapping our screens all day, whether it’s for apps or games. We’ve even seen the rise of games where tapping is the core of the gameplay, but what if we combined it with something else that people love, like RPGs? 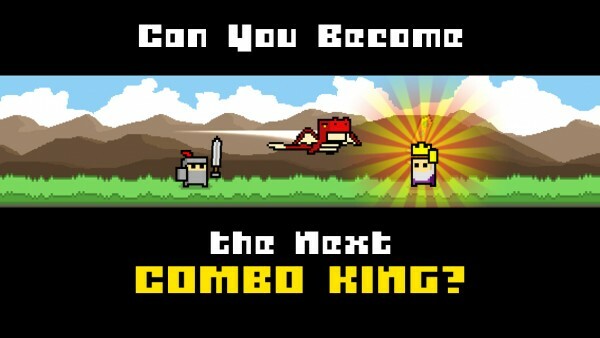 In short, that’s what Combo Quest is, and it is definitely an interesting mashup. The game sports beautifully retro 16-bit graphics that are sure to delight any old-school gamer. While the colorful plains environment remains largely the same, the game has a dynamic season change, so you’ll go through sun, rain, or snow on your quest. The game is fairly detailed in terms of the setting, with the lush grass and mountains in the background, and the character sprites are lively with personality. Animations in Combo Quest are smooth and fluid, and the chiptune soundtrack is sure to get you pumped up for the intense tapping battles. The sound effects as you slay your foes is a nice touch too. The story has a dragon taking the elusive Combo Crown, which you must earn back. 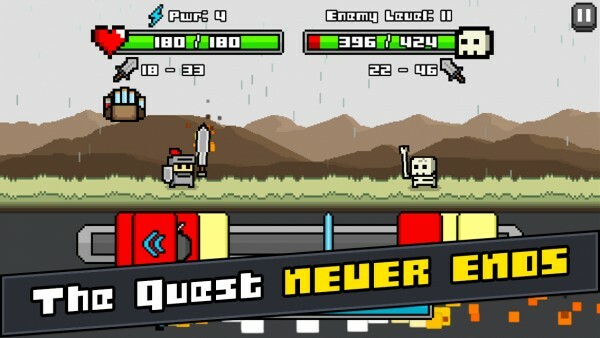 Combo Quest is an endless game, and your objective is to see how far you can get with a single life. You encounter single enemies in waves, and once they are defeated, you will get random rewards, such as increased minimum or maximum damage, combo damage, maximum health increases, full heals, or even more abilities for your powerful combo attack. You have one health bar, and each hit you take depletes a small chunk of it — if you run out, the game ends. As you advance through the waves, your power will increase, if you choose the right rewards, of course, but keep in mind the enemies will hit harder too. The controls in the game are simple enough for anyone to understand. Your character moves automatically, but you’ll have monsters in your way. Combat with them involves a bar in the bottom half of the screen that has colored blocks popping up on it as time progresses. 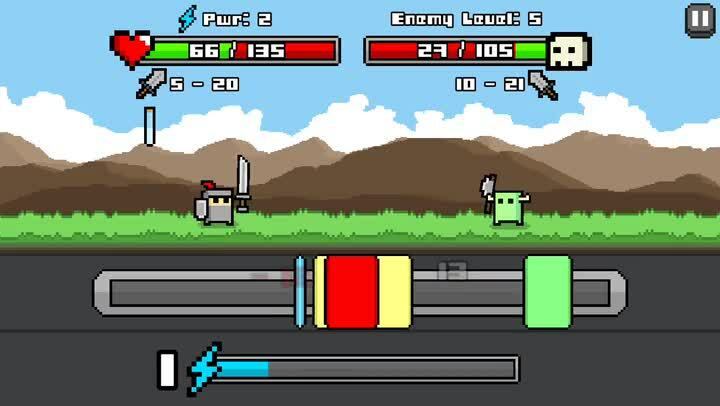 There’s a slider that moves back and forth along this bar, and you must tap the screen when it is on a block in order to attack (yellow for minimum and green for maximum damage) or block (red). Sometimes the blocks will have icons on them, which represent power-ups. These have unique results that you won’t know of until you try and hit them at the right time. 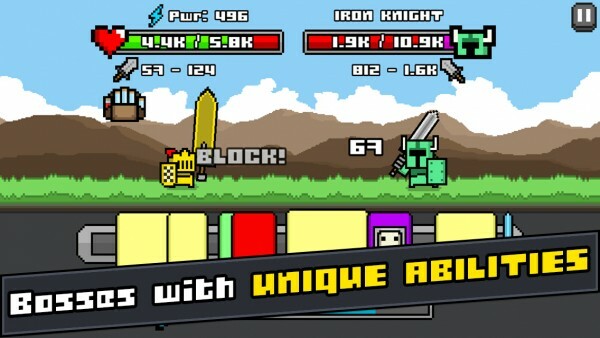 The more blocks you get in succession, the faster the ticker goes, and the more your combo meter fills up. When your combo meter is full, you can tap on it to unleash a devastating attack on the enemy. The higher the number is (combo), the stronger it will be, so you have to be precise with your taps. If you miss a block, the enemy gets a hit in and your combo resets. As you play, you can get potions and loot from fallen foes, which are going to be helpful when you start encountering the boss battles. When your knight gets stronger, you will see physical changes in his appearance, so the sense of progression is nice. Combo Quest already has high replay value, but this is only increased with the Game Center support for both leaderboards and achievements. 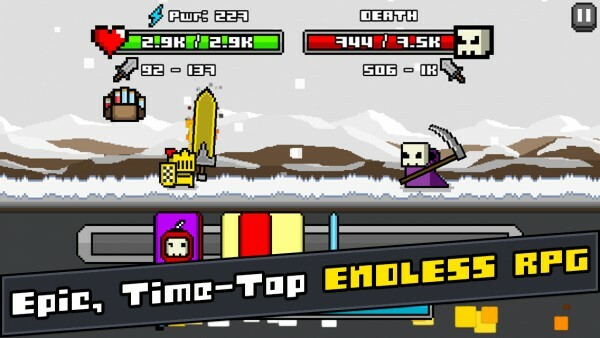 The leaderboards are for total enemies slain and highest combo, and 11 achievements will keep you coming back. 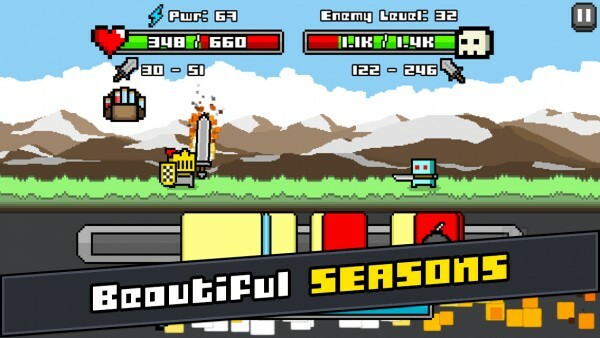 This is a fantastic mobile game to pass the time with. I’ve only been playing Combo Quest for a short while, but I can see this as being one of my go-to games when I’m out and have a few moments. The vintage visuals are awesome, the chiptunes are delightful, and the controls are simple but hard to master. I love the gameplay, as it is interesting, fast-paced, and challenging, since you have to focus on the right rewards to do the most damage for bosses. Combo Quest is a great test of your skill, and I highly recommend it to anyone who is looking for an interesting endless RPG to play this week. 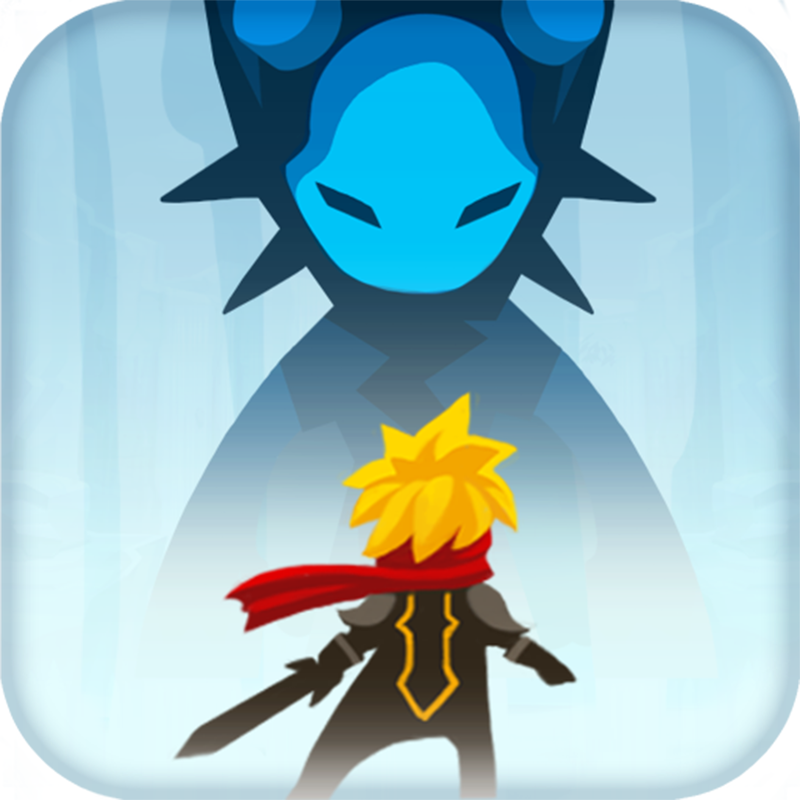 You can get Combo Quest on the App Store as a universal download for $0.99.